(RM forum thread from October 2014 on a topic that is as relevant today as it was then. emphasis ours). Posted by Rajiv Malhotra:Many Hindu leaders refer to themselves as Rightwing in order to differentiate from the Left. The Left/Right categories need to be understood as an instance of Western Universalism not applicable to us. After the French Revolution, in the new parliament it was possible for peasants also to get elected as MPs. Earlier the MPs were only feudal/landlords. However, the peasants and landlords elected did not like to sit together. For one thing, French people did not have the habit of bathing and hence their bodies would stink. The rich (landlords) had perfumes to cover up the bad odor. Perfume was expensive and used only by the rich. It was a sign of being rich. So the rich with perfume sat on one side, while the poor without perfume sat on the other side of the aisle in the parliament room. They did not know each other by name and the atmosphere was not always friendly. People started referring to an opponent as "the person on the Right (of the aisle)", and conversely, the man on the right would refer to "the person on the Left". The journalists started reporting to the debates as positions from the Left or Right respectively. This is how the poor seeking economic equality became known as the voices on the Left, while the elitists representing wealth were the Right. A foolish JNU student once asked me, "Sir I am confused whether you are Leftwing or Rightwing. Please clarify who you are." I replied: My tradition is to bather my body daily. Hence no stink and no need for perfume to cover that up. So I cannot be classified either as some using perfume to cover up the odor, or as someone stinking because of the lack of perfume. Jokes aside, the Left/Right categories are superficial, silly. In the West, Left/Right refer to two separate packages of values. But this simplification does not allow mixing and matching across these packages. Right commonly means a religious (i.e. Judeo-Christian) person who supports pro-rich economic policy, and elitist social programs. The Leftist is for the poor, against religion, bigger government, etc. Question: Was Mohandas Gandhi a Leftist or Rightist? He was championing the poor, making him a Leftist. But he was articulate about supporting his dharma, making him a Rightwing. Many Hindu organizations do a lot for the poor, contradicting this neat pair of categories. There are many "secular" elitists, billionaires, etc. - again not easy to put into a box. Hindu economic thought reflected in itihas, dharmashastra, arthashastra, etc. cannot be classified as elitist. It just does not fit this strange classification system. The lifestyle mandated for a brahmin is very simple, hardly resembling the typical Rightwing American. Hindus should not classify themselves as Rightwing. Many so-called champions of "the Hindu Right" have become sucked into WU and operate in this colonial framework. However, I do refer to some of my opponents as Leftists, because THEY brand themselves proudly in this manner. I am simply calling them by the name they give themselves. A White Hindu who attended my workshop yesterday in Washington did not understand why I criticized this Left/Right categorizing. I proposed that we abandon this way to classify ourselves, and classify behavior as dharmic/adharmic. Those ideas are better defined for us. She falsely assumed that I meant: Right = dharma, and Left = adharma. Hence she felt my classification system of dharma/adharma was insulting. She has no clue what dharma/adharma means and yet she blogs as "White Hindu". Need for more education. I am not merely changing words from English to Sanskrit. I am demolishing the framework in which Left/Right are ways of classifying all persons, my intention being to rescue Hindus from self-branding themselves as Rightwing. As a Hindu I espouse many qualities of the American Left and yet many other qualities of the American Right. I am not limited by either. I disagree with many things on both sides. This grid does not capture who I am. See below example of how Amercians are dissatisfied with the Left/Right dichotomy and are trying to build a new "synthetic unity". Why do we want to import this artificial divide in the first place? And then a decade later we will be borrowing American "Future Left" to cure the disease we imported. Instead we should develop new smritis using our frameworks. A Virtual Caucus on the “Future Left"
We'll be explaining what we mean by the “Future Left”—and how you can recognize it in yourself and others, and why it represents the future of progressive politics. Elizabeth Debold will also be a panelist and together with Steve and Carter, we'll examine how progressive politics is changing and how you can play a role in that transformation. Both Steve and Carter are close personal friends of mine and I have followed the development of their Institute for Cultural Evolution from its beginnings in 2012. Last April, their white paper, Depolarizing the American Mind, was released to the public on the same day as our Beyond Awakening dialogue, where Carter and Steve articulated their strategies for overcoming the "wicked" problem of political polarization in America by helping to evolve both the Left and the Right. Their thesis is that the political polarity of Left and Right is relatively permanent and existential, continuing to reappear in new forms as society changes and evolves. Their approach accordingly seeks to anticipate the future state of these existential political positions by describing the form that the “Future Left” and “Future Right” will likely take in the decades ahead. An evolutionary principle for working with positive-positive existential polarities, such as “liberal and conservative”, is that each pole needs the other for its own further and fuller development. If one pole dominates or vanquishes the other, pathology is the inevitable result. Applied to politics, this principle indicates that the most sound and politically effective liberal and progressive positions will be those that integrate legitimate conservative values, while still remaining true to their original progressive values. Conservative values can serve to improve liberal positions by challenging and moderating such positions in a way that makes them stronger. The same can be said about the role of liberal values in strengthening conservative positions. By helping progressive politics move from a position of antithesis, which rejects many of the values of the rest of American society, to a more synthetic position that can better value what America has achieved, we hope to contribute to the emergence of progressive political positions that are able to overcome polarization and accomplish many of their laudable political goals. As described in "Depolarizing the American Mind", we are working to evolve the overall consciousness of the American electorate by increasing the quality and quantity of what people are able to value. Better understand the deeper cultural and historical forces that explain how our nation has become increasingly polarized. Take part in a “participatory caucus” where you can voice your opinion and vote for your priorities. Develop a newfound hope and sense of potential in relation to the political, social, and environmental crises we currently face as a nation. Discover how to view current issues through a developmental lens―which changes how we think about creating change. Hear what pioneers of the “Future Left” have to say about the most important political issues of our time. Develop a new understanding of what political leadership entails from an evolutionary perspective. Rajiv: BD explains the absence of the "middle" in western thought, hence tendency towards two mutually exclusive options. NOTE: This is a long post, and I sincerely apologize for that. The topic is so vast that it is difficult to summarize. I request your patience and indulgence in reading this completely. The purpose of this extemporaneous message is to introduce the works of Pandit Kota Venkatachalam (my grandfather) and his work in re-constructing Indian chronology from primary sources. Pandit Venkatachalam’s work could potentially become the basis for the development of a Grand Narrative. Fortunately, step (1) above has largely been done for us by Pandit Kota Venkatachalam. We can use this as the basis for validation to begin work on step (2) and to ultimately develop our Grand Narrative. Pandit Venkatachalam took sanyas in 1957 and became the Peethadhipati of the Sri Abhinava Virupaksha Peetham, He was known then, as Jagadguru Sankaracharya Sri Advayananda Sankarabharati Swamy. Swamy ji attained Siddhi on November 12, 1959 AD, or Kali Saka 5060, Vikari, Karthika Suddha Trayodasi. The history of a civilization may be reconstructed from ancient texts, geological evidence, archaeological evidence, coins and inscriptions. Of these, ancient texts are usually considered the primary evidence, whereas the others are considered corroborative evidence. Pandit Chalam exposes the motives of the Indologists who, being staunch Christians, could not accept the Hindu belief that we are in the 28th Kaliyuga, which meant that the universe was 195 crore years old. They were convinced that, according to the Old Testament, the world was created in six days during October 4004 BC. Due to this, the European Indologists rejected the Puranas and other ancient texts as fiction, and began to look for European evidence to develop the history of India. William Jones was almost a century before Darwin’s Theory of Evolution, and geology accepting that the earth was a couple of billion years old. · Decided that Xandrames, Sandrocottus and Sandrocyptus, from Megasthenes’ Indika, were referring to, Mahapadmananda, Chandragupta and Bindusara of the Maurya dynasty, even though they were clearly referring to Chandramas (Chandrasri), Chandragupta and Samudragupta of the Gupta dynasty. Pandit Chalam spent significant years re-constructing the true chronology from primary sources while cross-referencing and validating across multiple sources. He corroborated his findings with inscriptions (eg, Aihole, two of Janamejaya’s inscriptions), archaeological evidence. He refuted the Aryan Invasion Theory, and came up with the “Out of India Theory”, suggesting that the Mlechchha kings, particularly the Yavana Kings (kings who had stopped observing Vedic rituals and were ex-communicated. They were driven to the north-western frontier of Bharatvarsha – to what is the present day Afghanistan) migrated westward to occupy the eastern and southern parts of Greece. This place is now called Iona, a bastardized name for Yavana, This would then explain how knowledge traveled from East to West, as well as the similarities between the Greek and Hindu systems and beliefs. The sources consulted by Pandit Venkatachalam for his work are too many to exhaustively name here, but a few examples are the Rig Veda, Surya Siddhanta, the Puranas (Brahmanda, Vishnu, Bhavishya, Bhagavat), Kalhana’s Rajatarangini, Nepal Rajavamsavali and Buddhist writings among many, many others. His hard work now provides us a re-constructed chronology, from which we can develop the history and thereby, the Grand Narrative. Please let me know if you have heard of him and his works, would like more information, or would like to collaborate on future work. This post is reproduced from this thread in Rajiv Malhotra's forum posted by Infinity Foundation India (IFI). Please visit the forum to follow the developments in this thread and thank these two independent Swadeshi Indology (SI) scholars for their contribution. two scholars from the SI movement have managed to effect a small but significant change in the official narrative of Indian history as was found in a link on the National Portal of India. They used provisions of the RTI (Right to Information) and the Public Grievances mechanism, to engage with ICHR, PMO, MHRD and NIC for about 6 months to get the change effected. Their achievement can be tracked through the below note. We hope that more scholars from the SI movement will be able to make meaningful interventions in the coming years on very many issues that pertain to the discourse on India. Many thanks to Manogna and Megh for their efforts. "Among various causes ascribed to the decay of Indus Valley Civilization are the invasion by the Aryans, the recurrent floods and other natural causes like earthquake, etc." "The Vedic civilization is the earliest civilization in the history of ancient India associated with the coming of Aryans. It is named after the Vedas, the early literature of the Hindu people. The Vedic Civilization flourished along the river Saraswati, in a region that now consists of the modern Indian states of Haryana and Punjab. Vedic is synonymous with Aryans and Hinduism, which is another name for religious and spiritual thought that has evolved from the Vedas. The largely accepted view is that a section of Aryans reached the frontiers of the Indian subcontinent around 2000 BC and first settled in Punjab and it is here, in this land, where the hymns of Rigveda were composed. The Aryans lived in tribes and spoke Sanskrit, which belonged to the Indo-European group of languages. Gradually, the Aryans intermingled with the local people and a historic synthesis was worked out between the Aryan tribes and the original inhabitants. This synthesis broadly came to be known as Hinduism. The Ramayana and Mahabharata were the two great epics of this period." "In ancient times, people from all over the world were keen to come to India. The Aryans came from Central Europe and settled down in India." 1. The Vedic civilization is the earliest civilization in the history of ancient India associated with the coming of Aryans. 2. The Aryans came from Central Europe and settled down in India. 3. The largely accepted view is that a section of Aryans reached the frontiers of the Indian subcontinent around 2000 BC and first settled in Punjab and it is here, in this land, where the hymns of Rigveda were composed. 4. Vedic is synonymous with Aryans and Hinduism, which is another name for religious and spiritual thought that has evolved from the Vedas. 5. The Aryans lived in tribes and spoke Sanskrit, which belonged to the Indo-European group of languages. 6. Gradually, the Aryans intermingled with the local people and a historic synthesis was worked out between the Aryan tribes and the original inhabitants. This synthesis broadly came to be known as Hinduism. 7. Among various causes ascribed to the decay of Indus Valley Civilization are the invasion by the Aryans, the recurrent floods and other natural causes like earthquake, etc. Vedic Civilization is associated with the arrival of some Central Europeans (Aryans) who spoke an Indo-European language Sanskrit, invaded Indian subcontinent around 2000 BC, contributed in ending the so-called Indus Valley civilization and during their stay composed the Rig Veda and "worked out" Hinduism while they "intermingled" with "the original inhabitants". 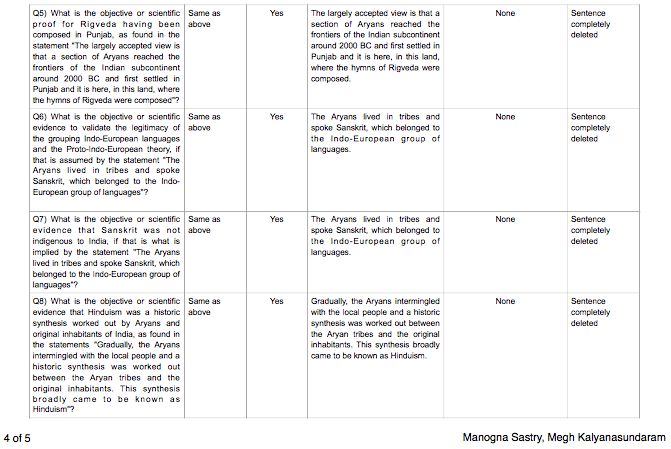 What should be evident to any objective reader is how (unsubstantiated hypotheses such as) Aryan Invasion and (Proto-) Indo-European have been used to ascribe (atleast in part and covertly, at the very least) origins of Vedas, Sanskrit and Hinduism to Central Europe when, till date, no absolutely conclusive evidence proves either of these, what may be not unreasonably called "motivated", hypotheses. [For some recent treatments of "Aryan" and "Indo-European", see Chavda A.L. 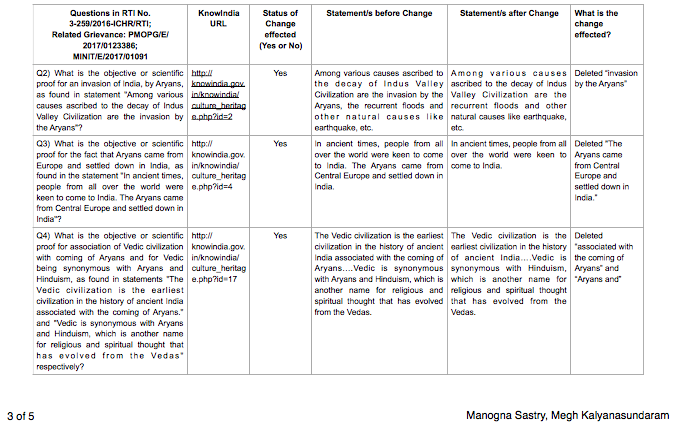 (2017), Aryan Invasion Myth: How 21st Century Science Debunks 19th Century Indology; Kazanas, Nicholas (2017), Fallacies of Proto-Indo-European; Sastry, Manogna and Kalyanasundaram, Megh (2017), Purva Paksa of Sheldon Pollock's Use of Chronology; Danino, Michel (2016), A series of lectures on the Aryan issue - PART 01 and The Aryan Issue (2016); Malhotra, Rajiv (2011), Breaking India, p. 15-35 “Inventing the Aryan Race”].